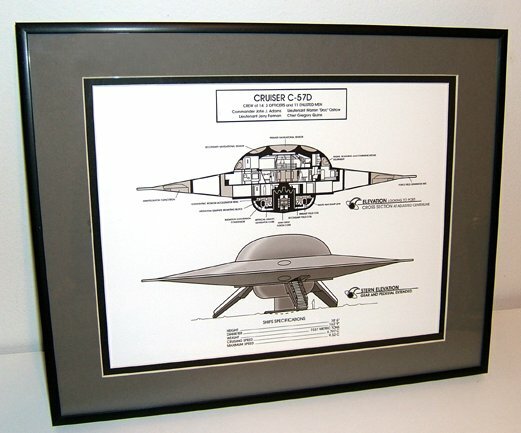 From "Forbidden Planet" comes this beautiful schematic of the "Galactic Cruiser C57-D". This hi-resolution print is very detailed and looks much like a builder's blueprint. The schematic is printed out on heavy stock premium white paper using a hi-end Xerox Techtronics printer. It is then professionally mounted on foam backing, matted and framed using a high quality aluminum frame and glass. Size of this item is a manageable 11" by 14", perfect for a den, office or even a bedroom. This beautiful technical piece can be purchased from me, Matt Palange, by e-mailing me at: astonmartin@adelphia.net. Price is $69.95 and includes shipping anywhere in the continental United States. International shipping is available, for rates please contact me first.